In an amazing show to unity, members of the online forum at 14ers.com have mobilized to help rescue a lost German shepherd stranded on the dangerous Sawtooth Ridge that connects 14,050 ft. Mount Bierstadt with the ridges of Mount Spalding and Mount Evans. You can read more of this real time rescue as it unfolds on the dog rescue thread. Rescue is underway for this lost dog found on the Sawtooth Ridge near Mount Bierstadt. We are following the story and will post an update when we know more. 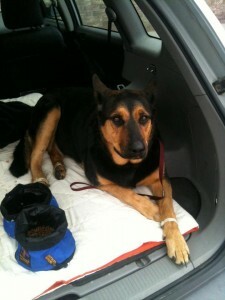 And the rescuers have posted a photo of the rescued dog! First, I would like to thank all those individuals involved in rescuing this dog. To the moron who left her to die after she became injured do to your negligence to provide her with the proper gear to protect her paws whilst climbing this type of terrain. And unwillingness to go back for her. Not only do you not deserve this dog but any other dog for that matter.